Bennachie means different things to different people. 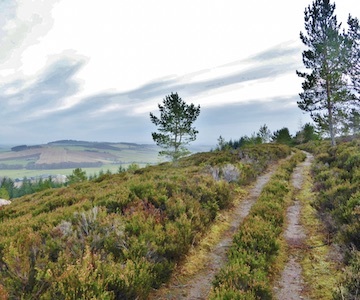 Nowadays most people think of Bennachie as an iconic feature in the centre of the northeast of Scotland, standing out in the landscape from every direction, drawing in walkers and sightseers from all around to survey the surrounding landscape purely for the pleasure of it. But it hasn’t always been this way. In the past Bennachie meant much more than just a day out. To many it was a working landscape that provided materials for building and for heating their houses, and not so long ago, for their very livelihood, a place to build their houses, grow their crops and feed their animals. The paths people tread today are waymarked and easily followed from carparks to hilltop viewpoints. In the past they were trod by people with more practical aims, lifting and transporting building stone, cutting peat for fire, fertilizer and insulation. These paths and routeways have now faded and are buried under heather and bracken, but they are still there to be rediscovered and for us to follow. Not this time for stone and peat, but to retrace the history and lives of those people that came before.